For anyone that has encountered a tick, you know how nasty of a pest they can be! Their preference of food is your blood and while they’re obtaining that, they can transmit Lyme disease to you. Symptoms of this infection can include fever, headache and various other unfriendly symptoms. Without the correct treatment, Lyme disease can stay for years and result in damaging effects. To avoid the harmful effects that come with Lyme disease, Absolut Pest Control has put together a list of preventative ways you can protect yourself and your yard! Remove all the brush and tall grass on your lawn to get rid of where the ticks would be hanging out. 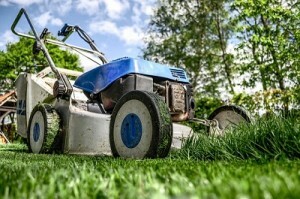 Remove any leaves and grass clippings as well! As an additional tip, you can use these in your compost pile for your garden! Ticks aren’t huge fans of walking on gravel or wood chips so place these between your lawn and any wooded areas to prevent ticks from accessing your property. If you have a messy woodpile that is located in a shaded area, you can bet that there will be ticks crawling around in it. Stack wood nicely in a sunny spot for it to dry out faster and keep the ticks out! They prefer a moist, wooded area over a sunny, dry area any day. Some chemicals used to prevent ticks can be harmful to not only you, but your yard and those around you. Instead of using a damaging chemical, try planting an American beauty-berry bush. The leaves of this plant have been shown to prevent ticks. While this may not be the best option, you can invest in chickens! Not only will you receive delicious, fresh eggs, but chickens will also take care of pecking at any ticks. If you decide to purchase chickens, be sure to do your research about shelter and food. If you’re still having issues with ticks, the best way to keep them at bay and prevent them from coming back is to contact a professional! For a free estimate on tick control, contact Absolut Pest Control at 978.388.4589 or by filling out our online form.